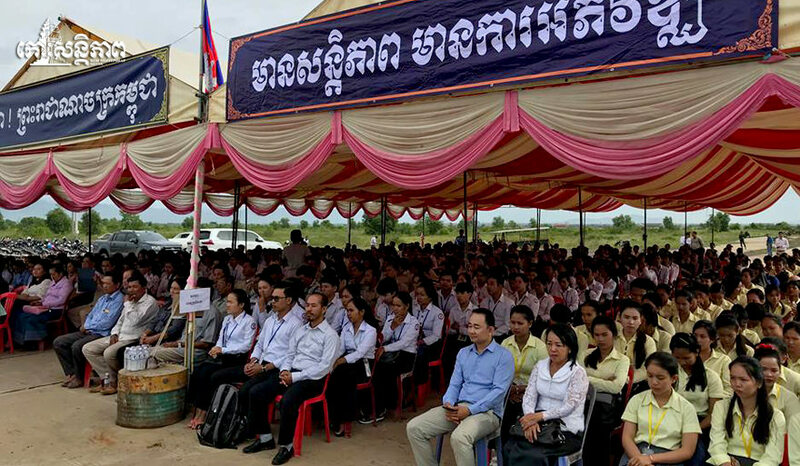 Kampot, Cambodia News: On August 8,2018, at 8 am, a groundbreaking ceremony was held for the future Kampot International Port in Teuk Chhou district, Kampot. The ceremony was celebrated by Dr. Thong Khong, the Minister of Tourism, and Mr. Cheav Tay, the Kampot governor, the representative of the Asia Development Bank, and about 800 relevant ministry officers. According to the official speeches, tourism in Kampot is increasing and the transporting activities are getting overloaded, so the Cambodian government has decided to build a new port which will cost US$8M to construct. 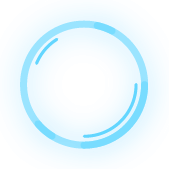 There have been many announcements in the past about the construction of a deep-water port at Kampot. 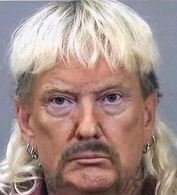 This time, it looks like a firm prospect. Eventually. A $10 million tourist port sponsored by Asia Development Bank will start its construction by the end of 2017 and finish in 2019. The new tourist port located in Chumkreal Commune, Tek Chhu District, Kompot Province. The site would attract 1.5 million tourists yearly and lead them to other amazing destinations across Cambodia. The record shown that for the first six months of 2017, Cambodia attracted 2 662 679 tourists in total including 89 525 tourist travelled by water increased 12.8% in comparison to last year. i thought it was off the highway to sihanoukville/bokor but all the reports say its south east in chum kriel commune which is the opposite side? i think that construction is for an oil terminal on the shv road side. Asian Development Bank is US backed. The Asian Infrastructure Investment Bank is the Chinese belt/road bank. 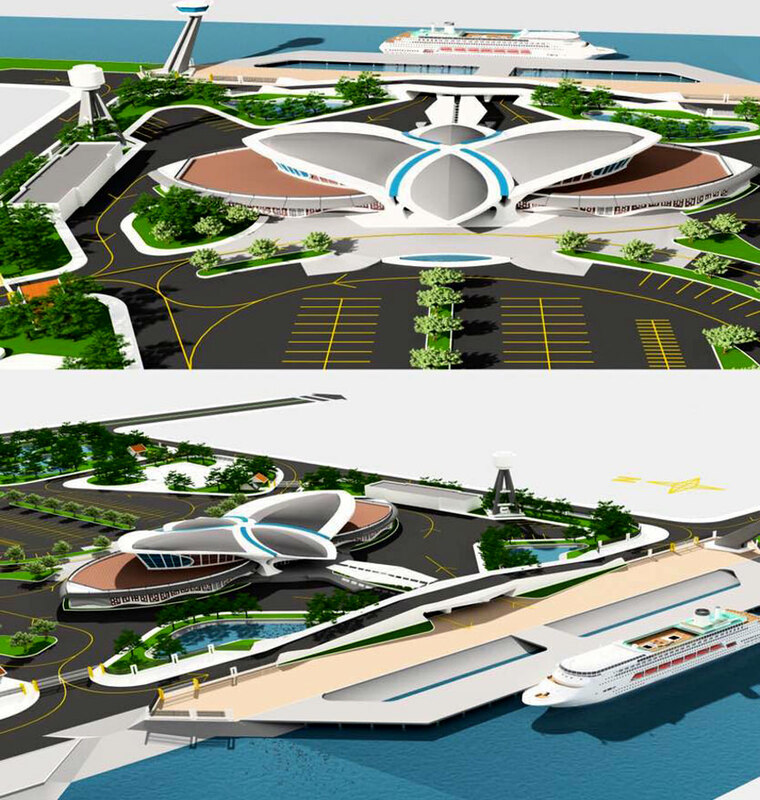 I think this ADB money is only for a passenger ferry terminal, a very small part of the total planned port structure. 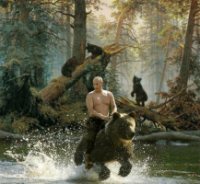 They are only talking about an $8M investment here, and elsewhere the estimates for a big (Chinese ?) deep-water container port at Kampot are around $300M. CEO is correct, this is the ancient, much vaunted idea about the passenger ferry. 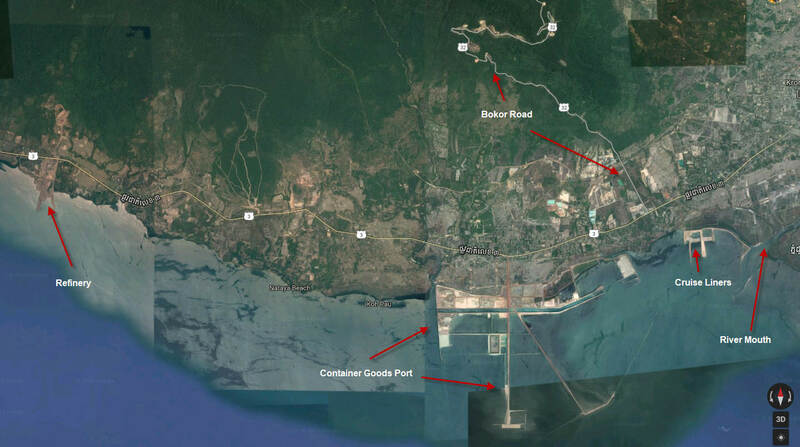 The mahoosive port complex that kgbagent took pictures of in the Kampot thread is further up the coast. Correct - the new ferry terminal is nearer Kampot town where the river joins the gulf nearly. Roads and a big cleared space for it been there for at least 2 years. The second is about 20km from Kampot and it is huge but apart from, when I last had a look, about 20 trucks an hour of fill being delivered there is no real sign of progress. Interesting article on Cambodia's present and future deep-water ports: Sihanoukville, Kampot and Koh Kong. Once a tranquil seaside enclave in southwestern Cambodia, Sihanoukville, or Kompong Som, has turned into a paradise for Chinese investors in recent years. Casinos, hotels, restaurants, massage parlors and supermarkets are festooned in signs in Chinese. More buildings are under construction, fueled by an incessant inflow of Chinese money and people. Although the city, 220 km southwest of the capital Phnom Penh and named after the country’s late king, is becoming a Chinese outpost, the key feature that makes Sihanoukville shine — the only deep-water seaport in the country — remains out of Beijing’s reach. The state-owned operator Sihanoukville Autonomous Port, or PAS in its French acronym, has been largely financed by the Japanese government for almost two decades. The port handles over 70% of Cambodia’s surface cargo, expanding hand-in-hand with the rapid growth of the Cambodian economy, while being the largest listed company on the local stock exchange. The port also symbolizes the rivalry between China and Japan in the country. Beijing is being frustrated by Tokyo’s renewed resolve to further tighten its ties with the port. On June 25, the port opened its latest extension with the help of Japanese funds. A new multipurpose terminal has a pier with a depth of 13.5 meters, allowing larger cargo ships and bulk carriers to anchor. Another quay is reserved for the country’s first oil and gas exploration logistics base. An offshore oil and gas field, discovered in the Gulf of Thailand, is now being developed by KrisEnergy, a Singapore-listed unit of Keppel Corp., and is expected to begin operations by 2019. Chairman and Chief Executive Lou Kim Chhun told the Nikkei Asian Review in a recent interview that this will allow “enough big ships to come in, while solving capacity limitations.” When completed as planned in 2023, the port could accommodate more than 90% of all ships in the region, up from 20% now, in terms of numbers. The seaport, which is being built​in Tek Chhou district, will be able​to accommodate one million travellers,​Dr. Thong Khon, the Minister of​​​ Tourism, said Tuesday during a visit to the construction site. He said the port will become a key infrastructure in the Kingdom’s logistics and transportation network. “Kampot’s international seaport began construction in August last year and is now about 25 percent complete,” he said. 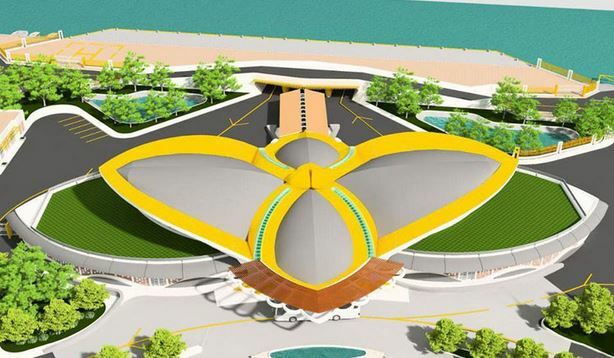 The project is scheduled for completion by the end of the year to coincide with the Sea Festival, which will be held in the province for the second time, the minister said. “Located in the southern economic corridor, the port will connect Kampot province to the world. 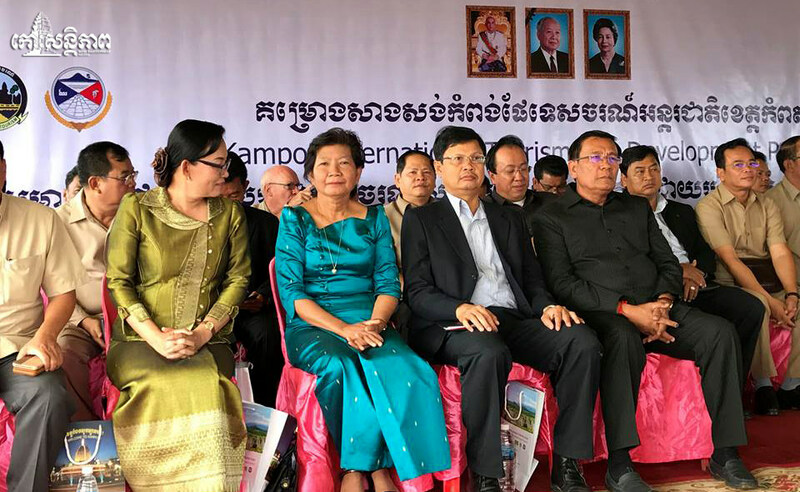 “It will boost the development of tourism and related sectors in Kampot and other destinations in the coast,” he said, adding that the port will boast facilities that match international standards. The project is supported by the Asian Development Bank (ADB) and is part of the Greater Mekong Sub-region Tourism Infrastructure for Inclusive Growth Project, Mr Khon said.